Quilt As Desired - Five Quilting Methods For A New Quilter to Consider. Most commercially available quilt patterns end their written instruction with quilt as desired…and you’re left there thinking wait, How do I quilt this? For some it’s not a problem and for others they feel like they’ve been abandoned. They’ve provided written instruction for you every step of the way from telling your how much fabric to purchase, what to cut, possibly the order in which to cut, the steps to stitch the pieces together for the desired block and then how to put it all together and possibly apply borders to finish piecing your quilt top, but no quilting. I remember being a little frustrated when I finished my 1st top and read “Quilt as Desired”. As a new quilter I didn’t have a clue how to get it to the snuggle on the couch stage! I wanted someone to at least give me options. So let’s take care of that now. It’s been nearly 20 years since I pieced that 1st quilt top and I have all kinds of experience on the subject, both as a student learning along the way and as a professional quilter. Are you ready? 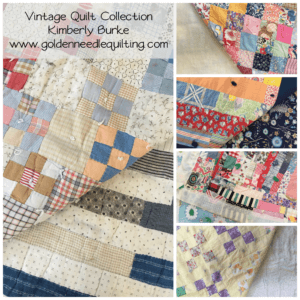 Grab a cup of coffee , have a seat and I’ll give you the info I wish someone would’ve given me as a new quilter. This info is not intended to be the end all on all the ways to get your top quilted. There’s more than one way to do things. The options I have are the most common in my opinion. Some easier than others. Some less expensive than others. I just want you to walk away with a general understanding of some of the options out there so that you can decide what is best for you. Option #1 – Tie your quilt. Learning to tie a quilt top is fairly simple. I have a few tied Vintage Quilts (collage below) that I have rescued from garage sales and thrift shops and a couple that were gifted to me by a family friend. Most of the ties are still in place but a few have disappeared or maybe worn through the fabric in the quilt top. From baby quilts to bed quilts the tied method has been used for a long, long time. It gets the job done inexpensively. I don’t believe it’s as durable as machine quilting but there’s nothing wrong with choosing this method if it gives you what you want. The basics on tying your quilt. You will need a firm work surface (counter, table, kitchen floor, etc) where you can sandwich your three layers together. You’ll need basting safety pins or something similar to baste your layers together. The quilt layers; quilt top, batting and quilt back. The batting and quilt back should be larger than your quilt tops measurements. To actually tie it you’ll need yarn or embroidery floss and a tapestry needle. I think that’s everything. Although I’d need a pair of readers to get the job done. If you are a visual learner, like I am there are a wide variety of videos on YouTube. This one from Connecting Threads is short and sweet and gives you the necessary details. It’ll get you off to a great start and there are many to chose from if you’d like to see more. I can’t imagine hand quilting. Don’t get me wrong I wish I could and encourage you to try it. If you’re a hand quilter you have my utmost respect. My understanding is that most don’t start off with perfectly sized and placed stitches but it’s something to shoot for and in the meantime you have your tops quilted for the price of needle and thread… and the time it takes to do it. If you pick up the skill and figure out that you not only enjoy it but you’re AWESOME at it send me your contact info. I’d love to have one piece that’s hand quilted that I had a part in. Hand quilting is where it’s at! Yup, I love it! I have one hand quilted treasure which was well loved long before it found it’s way to me. I wish I knew the story behind it, but alas it was a garage sale find and now resides at the base of my hutch. Each time I pull it out I wonder who it was made for and by whom. If you’re interested in learning to hand quilt there are a number of good videos on YouTube. If you are going to take the time to learn to hand quilt let’s get you started on the right foot. Sharon Schamber is an incredibly gifted hand quilter (machine to for that matter). If you ever have the opportunity to see her work in person, do not miss it! Her hand quilting video is nearly 30 minutes long but it’s well worth every minute. She’s very easy to listen to and just about has me convinced to try it again. Option #3 – Machine Quilt It. Quilting on your sewing machine is not only possible, it can produce amazing results! The key word for this is practice. Should you decide to master this method pay attention to your posture and work area. The angle needed for a quilter to accomplish this on a sewing machine can cause all sorts of issues if they are straining due to insufficient viewing space in the harp area, such as migraines, neck pain and eye strain. Listen to your body and take frequent breaks. I can do it for about 15 minutes or so but can’t do much more with this method. I’m guessing it has something to do with the windshield I slammed into when I was a kid. There is a ton of information out there for quilting with your sewing machine. I recommend checking out Leah Day’s website, specifically her Free Motion Quilting Project where she has a plethora of how to videos. Here’s the 1st one. Quilting on a DSM combined with the tie method can also be done. I did this a few years ago on some diaper changing pads for my grandson. I used the programmed button stitch and it worked great. They’ve held up well given all the laundering and are currently being used for our 2nd grandson. The last option I’ll cover here is hiring a professional machine quilter. This is by far the easiest way to get your top quilted. The costs vary depending on the services you select and location. 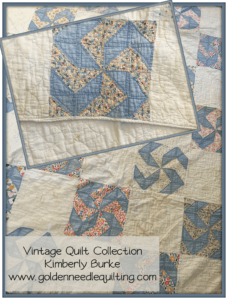 Consider asking a quilt friend or your LQS for recommendations. Interview a few to find someone you want to work with. Here are a few suggestions for the conversation. Ask to see examples of their work. What are their fees and how are invoices calculated? What’s their turn around time? Should the longarm quilter run into a problem while working on a quilt how do they handle it? Are they computerized, freehand or maybe a mix of both? Do they stock batting and thread? Is it a smoke free environment? Most professional machine quilters have invested thousands in equipment, tools and professional development. They should be happy to discuss any question you may have. They may also ask a few of their own questions. This can be helpful to both parties. I opened Golden Needle Quilting in 2006. Our home is smoke free and pet free. I have 20 years experience in the piecing side of quilting and more than a decade of experience machine quilting for myself and others. I enjoy working with new and seasoned quilter’s alike. My longarm, Little Gadget is a Gammill with Statler Stitcher which is a full sized, commercial machine. The quilt studio, a.k.a.the family room is all hers and she needs it. She’s not little by any sense of the word and easily handles generous king sized quilts down to small wall hangings. The majority of the work we do is computerized however we do some freehand work when needed. We literally have thousands of quilt patterns and there are more available. Custom quilt patterns are also available if you have something specific in mind. You can view the services I offer under the Quilt Info tab on the menu as well as request an estimate. I would love to discuss your next quilt project with you in person or over the phone. I hope this gives you a better idea of the options available to you the next time you read the dreaded words “quilt as desired”! If I can answer any questions please send them to me here. For an estimate please fill out this form and I’ll be get an estimate to you ASAP.